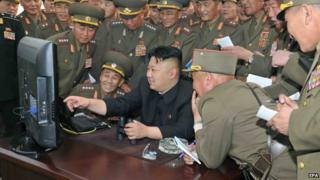 Why did North Korea's internet go down? There is a great paradox about technology in North Korea. On the one hand, the country is very tech-savvy (one in 12 North Koreans have smartphones) and computers are not uncommon. But, on the other, the great mass of the people are blocked from the world wide web. They can access the country's own intranet, with websites of North Korean news, cookery and innocuous topics, but can't get anywhere near outside websites. So determined is the regime to prevent this view of the outside world that embassies in Pyongyang were ordered not to use wi-fi, because North Koreans might be able to get access from outside the building. This means that the disappearance of the internet inside North Korea would not have been noticed by many ordinary people. It's true that the main newspaper Rodong Sinmun's website was inaccessible, but it could have been viewed on North Korea's internal system, the intranet system which some ordinary people can use. Access to the world wide web is reserved for the trusted elite and for students training for commercial or military work. If the North Korean system was brought down, the obvious suspect is the United States. President Obama promised/threatened a response to the Sony intrusion "in a place and time and manner that we choose". It would be proportionate. A spokeswoman for the administration said that some responses would not be revealed to the public: "As we implement our responses, some will be seen, some may not be seen." This is not a universal view among tech experts, though. The blog North Korea Tech says it was probably a cyber attack but cites experts who think it may well have been committed by individuals. "I'm quite sure that this is not the work of the US government," said Dan Holden of Arbor Networks. He argued that the US wouldn't make an attack so obvious: "Much like a real world strike from the US, you probably wouldn't know about it until it was too late. This is not the modus operandi of any government work." He wondered if "Lizard Squad" did it. These are the people responsible for the denial of service attacks against Xbox Live. Or maybe Anonymous, which is said to be unhappy at North Korea over the pulling of the film The Interview. If, however, it was the Americans, were the Chinese colluding or even helping? They've denied it but we are in a dark world where denial on all sides is obligatory. It is thought that China is exasperated with its troublesome neighbour. A retired Chinese general recently wrote about how he found the Democratic People's Republic of Korea tiresome: "China has cleaned up the DPRK's mess too many times. But it doesn't have to do that in the future." This is not the kind of statement published without some sort of approval. The sole route for the internet into North Korea is through China. It may be that if the United States was behind the attack, China helped or at least turned a blind eye. But we are in the realms of wild speculation now. Was the attack worth it? According to Chang Yong Seok, an expert on North Korea at Seoul National University, a cyber attack on North Korea would not cause serious disruption and so be an exercise in futility. "Even if their internet is shut down, the inconvenience will be shared only by members of the power elite." But that may be the point: just sending a message to those in power that they are vulnerable. What is FBI evidence for North Korea hack attack?